Apple blew away market expectations in reporting the results of its fourth fiscal quarter of 2014 on Monday, propelled by a new quarterly record for the iPhone and new all-time record for the Mac. Following the announcement, executives from the company participated in a conference call with analysts and the media, and notes of interest follow. Apple earned $8.5 billion in profit on revenue of $42.12 billion in the September frame. It reported shipments of 39.27 million iPhones, 5.5 million Macs, and 12.3 million iPads. 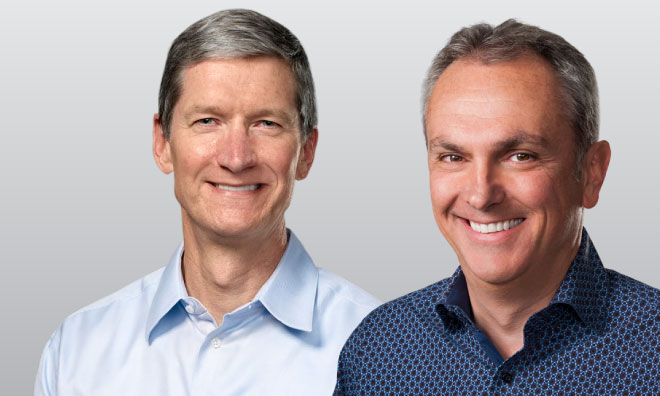 Participating in Monday's call were Apple Chief Executive Tim Cook, and recently-appointed Chief Financial Officer Luca Maestri. Starting next quarter, Apple Pay revenue will fall under the "Services" category, iPods will be measured under "Other Products"
Apple exited the quarter severely behind on demand for both the iPhone 6 and iPhone 6 Plus. iPhone sales grew 16 percent, but underlying demand was even stronger. Unit sales in the U.S. grew 17 percent year over year, and in Western Europe they were up 20 percent. Even stronger growth in Latin America and the Middle East. Sales more than doubled in Eastern Europe. Apple was below its target range of 4-6 weeks of channel inventory. Apple had a 69 percent share of the U.S. commercial smartphone market. Maestri cited a survey that said 75 percent of enterprises looking to buy in the September quarter will choose iPhone. Due to growth in emerging markets, Apple will begin targeting iPhone channel inventory in the 5-7 week range. Cook said that "it's clear" that Apple is "not nearly balanced" when it comes to supply and demand. "We're not even on the same planet." "It's very unusual to see every country having a marked improvement over the previous year, and that's what we're seeing on iPhones," Cook said. "We do not envision, as of today, being able to achieve the extra inventory in the channel that we believe is needed," he said. Apple is changing its channel inventory policy because the channel tends to be a long process in emerging markets. "It's hard to tell when you're at a point when you're selling everything you're making," Cook said of assessing demand. "It's a good problem to have." Cook still sees a large opportunity for people buying their first iPhone, and he thinks that opportunity increases with the iPhone 6 and 6 Plus. He also expects a high number of upgrades from previous iPhone owners. Average selling price of the iPhone in the September quarter was $603. Unit growth of 16 percent year over year compares to the prior quarter at 13 percent. On Apple Pay, Cook said Apple is focused on consumer experience as well as security and privacy. He said other mobile payments systems are about monetizing user data, but Apple is not interested in that. "We think we will sell more devices, because we think it's a killer feature," Cook said of Apple Pay. "It's far better than reaching in your pocket book and the card that you're looking for, and half the time it not working." Apple does not charge the customer or the merchant for the benefit, but there are terms between Apple and the issuing banks. "We will be reporting Apple Pay in the services line item on the data sheet, and so we see it as an incredible service that is the most customer centric mobile payment system that there is," Cook said. "We're very proud of it, and we can't wait to sign on more retailers and also extend it around the world." Mac sales grew almost 1 million from a year ago to reach a new all-time high. Back to school sales were strong, as were sales in emerging markets, where sales were up 46 percent. Maestri said Mac gains were mostly in portables: MacBook Pro, MacBook Air. Apple ended the quarter with Mac channel inventory slightly below its 4-5 week target range. Mac was an "absolutely blow-away quarter," "stunning," Cook said. Notebooks and back to school drove sales. "If you went out to college campuses right now, you would see a lot of new Mac notebooks, based on the sales," the CEO said. "To be up 21 percent in a market that's shrinking, it doesn't get any better than that," Cook said. Cook admitted some people will look at a Mac and iPad, and opt for Mac. Others will look at iPhone and iPad and choose iPhone. He said he's OK with both of those. "I'm very bullish on where we can take iPad over time." IBM's new iOS-based mobile solutions, as part of its enterprise agreement with Apple, will begin rolling out next month. They will be available in the following markets: banking, government, insurance, retail, travel and transportation, and telecommunications. Hundreds of corporations around the world have expressed interest since the IBM deal was announced. Apple is currently working with over 50 of them for mobile deployment solutions. Apple reduced iPad channel inventory by 500,000 by the end of the June quarter in anticipation of October's refresh. The company continues to see strong adoption of the iPad in the corporate market. On declining sales, Cook said market watchers should focus on the big picture rather than the last 90 days. "I view it as a speed bump, not a huge issue," he said. "That said, we want to grow. We don't like negative numbers on these things." He doesn't think the tablet market is saturated. Cook noted that the country that sold the lowest percentage of iPads to people who never bought an iPad before, the number was 50 percent. The range goes from 50 to over 70 percent. "When I look at first time buyer rates in that area, that's not a saturated market," he said. "People hold on to their iPads longer than they do a phone. And because we've only been in this business four years, we don't know what the upgrade cycle will be for people." "The deeper the apps go in the enterprise, the more it opens up avenues in the enterprise," Cook said. Revenue from iTunes was $5.4 billion in September, up 22 percent year over year. The number of registered app developers has grown by 22 percent over the last year, rapidly approaching 10 million. Store revenue last quarter was $5.1 billion, up 15 percent from a year ago. A new Sept. quarter record. Opened 10 new stores, completed the remodels of 3 stores. Projecting 25 new store openings in fiscal 2015, about 3/4 of which will be outside the U.S.
Five more remodelings are expected. Average revenue per store was $11.9 million, compared to $10.9 million a year ago. Over 18,000 visitors were seen per store, per week.